Get more of Dwayne Johnson in the ‘Hercules’ Extended Cut Blu-ray this November. Paramount and MGM have revealed the release date, special features and cover art for Brett Ratner’s action adventure Hercules on Blu-ray and DVD, starring Dwayne Johnson, Ian McShane, Rufus Sewell, Joseph Fiennes, Peter Mullan and John Hurt. The Blu-ray 3D Combo Pack, Blu-ray Combo Pack and DVD releases will arrive November 4 and two weeks early on Digital HD October 21. Check out the Blu-ray cover art and special features below. Everyone knows the legend of Hercules and his twelve labors. HERCULES begins after the labors, and after the legend. Haunted by a sin from his past, Hercules has become a mercenary. Along with five faithful companions, he travels ancient Greece selling his services for gold and using his legendary reputation to intimidate enemies. 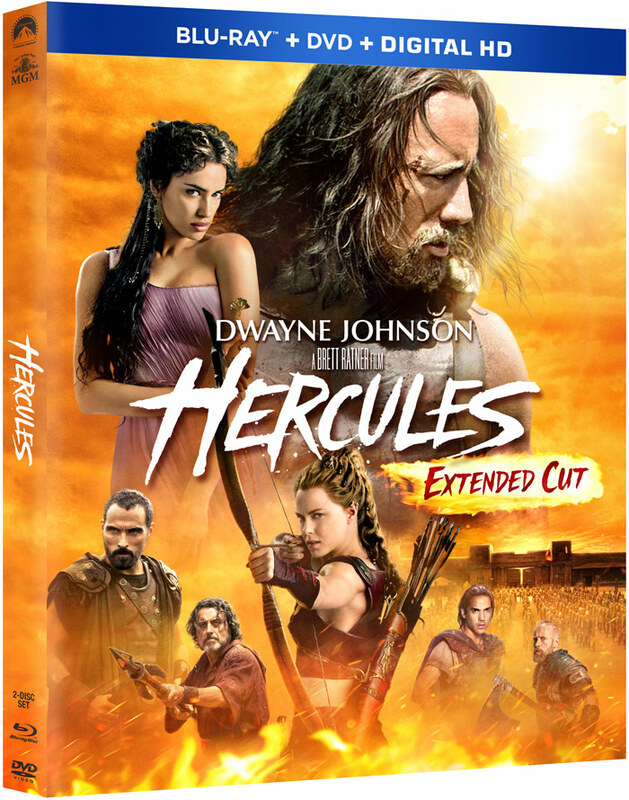 But when the benevolent ruler of Thrace and his daughter seek Hercules’ help to defeat a savage and terrifying warlord, Hercules finds that in order for good to triumph and justice to prevail… he must again become the hero he once was… he must embrace his own myth… he must be Hercules. Hercules and his Mercenaries – Delve into the story behind the team assembled by Hercules for his perilous missions and the skills required of them. Weapons! – Exploration of the weapons created for the spectacular action scenes, including training with the actors. The Bessi Battle – Discover how one of the major action sequences of the film was created with the filmmakers, actors, stunt team, make-up effects and more. The Effects of Hercules – A behind-the-scenes look at the film’s spectacular visual effects.